Thomas was born with a rare congential heart defect, aortic to left ventricle tunnel, which was corrected by surgery at just 15 days of age and then repaired again at 15 months at Westmead’s Children’s Hospital. At 4 years of age Thomas was diagnosed with High Functioning Autism which helped explain some of his little quirks, especially his diet of only lamb cutlets and Sunkist cordial. The cooking of the lamb cutlets which he called choppies, became an art of perfection with only his mother allowed to do this in the same pan and placed on his 2 same shrek plates. Poor Mick would come home from work and smell the cutlets cooking and think mmm lamb dinner! But no we just ate mince. Sunday 19th April, I was watching on the lounge and Thomas was in his room and his brother was asleep. Thomas came out huffing and puffing saying mum, come watch me on the computer, I said hold on, are you ok .. he was short of breath and said yes, I went into his room and sat on his bed and watched him play his computer for about 20 minutes and was concerned how short of breath he was, I felt his heart and it was racing, I took to Cessnock Hospital, he had an ECG, and sat brilliantly for it, major shock for me, as he didn’t like doctors or anyone touching him, you were allowed to listen to his heart and that was it, but the nurses weren’t allowed to do this only the doctor as since found out males were allowed, females weren’t. His heart was at 140 bpm, everything else was ok with the ECG, he was sent home with a follow up with his cardiologist on the Tuesday, by this time his heart was back to 101bpm. But following this he, well we thought it was behavioural, didn’t want to walk anywhere, always asking to be carried (and did carry him everywhere) but still looked good and still was our Thomas. Just not the wild Thomas running around the house pretending to be the ghost from Scooby Doo scaring his younger brother. He had slowed down and started complaining of having a sore tummy, I had him at the doctors where they checked him over and couldn’t find anything wrong but told him he has to eat something other than Lamb Cutlets and this made sense, as this was thought to be hunger pains he was feeling, he only ate 6-9 lamb cutlets a day and I would be hungry if that’s all I had. At the end of term 2 this year( 1st July) he was tired a lot and not feeling well, I took him to the doctors and the doctor said he has to go to Maitland Hospital as Cessnock does not take kids as his sats were only at 85%, we got there, he was checked over and was told that he is not breathing at 85% because he is not blue, the machine must be broken, they did ECG’s, X Rays, Bloods .. they were brilliant and then sent home for a follow up the next day, which we were told a virus was shown in his bloods and sent home and 2 days later he was back to normal so to speak without the excess energy. But again due to his autism I thought that this was normal so to speak. He would be awake at about 8am and be awake all day, playing his games, watching tv and go to bed about 8pm at night, some days he would want to walk whilst I did the groceries other days he wanted to be in the trolley, all seemed normal for him. Second week of term three, he started 4 days a week at his satellite Autistic school, Thursdays were excursion days, the first week was a 4 km walk and I didn’t send him as I knew he wouldn’t make it .. he would be too tired, but the next Thursday 31st July 2008, was at a nature reserve in Newcastle and he had been really good before then, so I sent him to school only to a phone call at 12.30pm that day to say Thomas had lots control of his bodily functions and was a shade of blue, I jumped in the car and drove the 40 minutes to get him and took him to John Hunter Hospital in Newcastle which was only 5 minutes from where they were. I was told a lot of things that could have caused this, stroke, seizure etc, he was breathing at 70% and admitted to hospital. He refused to put on a oxygen mask, so we just had to hold it near him for blow over, of a night we could get it closer and his sats would go to 94%, but of a day without the oxygen he sat at 85%. We were told that this is probably his normal saturations. He had a blood test which showed he has been blue for about 12 months. This then made sense of Thomas always complaining of feeling cold, as he had poor circulation. He was always wearing layers of clothes and at home sitting always next to the heater. ICU doctors came to have a look at him incase he needed to go to ICU, so they could see what we classed him as looking normal. We spent 9 days in hospital, due to his behavioral/autism was given an general to have an Echo (as always mucked up for this at his cardiologist) which came back that it was not anything to with his previous heart condition but had pulmonary hypertension, which to me was a relief, not knowing what was PH was. Then on the Thursday they again gave him a general and he had a MRI which on his discharge papers said MRI grossly abnormal. Whilst in hospital for this stay he would chant “choppies at home” to anyone that walked into his room, we were gate passed a couple of times just so I could feed him and bought him a Ninetendo DS just to help entertain him as he was getting sick of watching DVD’s and missed his playstation. On the Friday we came home and he was started on Sildenfil, which we put in his Sunkist as he wouldn’t take anything else orally. We now noticed that he was constant shade of blue, with his finger and toe nails remaining blue. He had a week at home before going back to his cardiologist for a check up. He just played his playstation and ate his choppies. I took him to school one day so he could get his school photos’s taken. In this week at home I googled PH so much that it made me so scared but had hopes of medication working. Monday 18th August he had a follow up with his cardiologist, who didn’t like the look of him and said he needs to be hospital so we took him straight back to John Hunter Hospital where he was admitted for a further 5 days. Thank god for the Ninetendo DS as this helped entertain him and he knew he was only allowed his DS in hospital so he wasn’t that worried that he was back in hospital. They stopped the sildenfil and he had a cannula put in … against his wishes, and was getting lasix by IV, and was started on bosentan and spirolacten orally, which was a major drama, as the sildenfil I could hide in his Sunkist as syringing medications into him was enough to turn him blue. He complained a lot of having a sore tummy and found this to be that his heart was in Right Heart failure so therefore his liver was backing up, only after a couple of days of IV lasix, his liver became soft again so the fluid had gone. He also came home on 1½ litres of oxygen, which putting him on that impressed me so much how he put up with have the prongs tapped to his little face, with the actual prongs cut off so nothing went up his nose as this bothered him too much. So we were home on the Friday, fighting with him every morning to syringe his 3 meds into him, he would hold the medicine in his mouth, nothing we did could make him swallow it .. I would hold his back for gravity, he would gag and then sit him up and he just spit it out. After 2 days he complained again of a sore tummy, now knowing what to look for I felt his belly and felt his liver was again enlarged, so I decided to put his lasix in a can of Sunkist as could easily be disguised and only fought him to take 2 meds and two days later he didn’t complain of his belly hurting. We also came home from hospital with a wheel chair and he loved being pushed around the game shop in this. The following Friday he started to go off his Lamb Cutlets refusing to eat or just chewing on the bone and spent most of the next three days in bed, not even eating or drinking. He just complained of being tired and having a sore belly. Thomas absolutely "buggered" - This was taken on the 7th October in the school holidays - if you look closely you can see Thomas is cuddling a well chomped on choppie bone. When I got home on that Monday 1st September 2008, from work, I sat him up to fix up his prongs on his face and he was puffing so I took straight to Cessnock Hospital where his feet were quite blue and upped his oxygen to 4 litres and got him stable then we were transported by ambulance to John Hunter Hospital. We spent many hours as we did each time in the emergency department getting all the ECG’s, x ray etc done, they tried to put a canula in and he fought it, as usual but this time his sats dropped to 30. The doctor told us that he would go into cardiac arrest if they persisted with this, again ICU came down and said that he possibly won’t make it through the night and we had to make a decision as to what we wanted them to do if this happened. This was hard, it took a couple of hours to get his sats back up to between 70 – 80% and were moved to the ward at midnight. We didn’t much sleep, in the morning we were moved to a private room and had a meeting with the doctors to discuss Thomas on the Tuesday afternoon. In this meeting we were again asked what we wanted if he was to go into heart failure and we said do anything you can to save our boy. They also said they would put a Percutaneous Endoscopic Gastrostomy (PEG) in his belly, so he could get his full medications and feed him as they were very aware of what Thomas was like with taking his meds and his poor diet. We were very happy and relieved to think this PEG was his answer. They also put him on a WHO machine (Warm Humidified Oxygen) and was comfortable on 4 litres with his sats at 85% and even let the prongs into his nose. We were also told that we could lose him tomorrow, next week or he could last two years. They wanted him to get put under a general to get a feed tube put in so that he could get his meds before he had the PEG put in, this was going to be scheduled for that afternoon, but that anethiest said he wouldn’t risk putting him under twice in a week and that Friday’s Surgery is more important than a feed tube. Until the PEG went in, the staff were syringing his drugs into him with Thomas telling them to “Get off me”, “Go, Get out of my room”, he always used his words well and always said No thanks to his medicines. Friday 5th September he had his Operation to have the PEG put in, and came through this beautifully and back on the ward in the afternoon. We were then told they didn’t expect him to come back to the ward as they had actually booked him into ICU, so everyone, staff included were very surprised his heart tolerated this. I was over the moon and so excited. There was a slight hiccup in recovery, the nurse pulled out his canula but the surgeon said in Thomas’s circumstances he would allow them to use the peg ASAP for his medications as again they couldn’t risk putting it back in. On the Sunday they started him on gastrolight, Monday they started him on feeds and vitamins and minerals and I honestly thought we had won, he was tired though all day but sats were stable. Throughout Tuesday he slept all day, waking at times saying “Mum, I am tired”, I would tell him to have a little sleep and just lie down and he would lie back down and go to sleep. His sats were dropping and hovered between 60 -65%. A doctor came that evening and we did a blow over of 10 litres. I asked if he wanted to go home and he just told me “ I want to stay here”, he held my arm with his two hands while I tried to get more oxygen into him and he fell asleep. I got up and packed up his games, which this time he wasn’t interested in, I just didn’t want his stuff to get lost when we went to ICU, I just had a feeling something was not right. I hardly slept that night. 6am on Wednesday morning (10th September 2008) , Thomas woke up and woke me saying he needed to go to the toilet, I did my usual juggling of leads and machines and picked him to stand him while I moved the two machines (feed and oxygen machines) and he spasmed on me, which I was told was he went hypoxic, I buzzed like crazy, by the time the nurses came he was talking again and I felt I imagined it, they got a doctor and again ICU came down to visit. His sats had dropped and they put him on 8 litres through the WHO machine then and blow over of 15 litres, but nothing was really sustaining him. I told the nurse with me that this is what would have happened to him on his excursion as he again had lost his bodily functions. I sat and cried telling the nurse, this is the end, I know they can’t help him. I rang my husband and said things aren’t good. My husband and my parents came straight down. His cardiologist came and did an echo and was very quiet and said he may have an infection. He then had a ECG. So then the room was full of his surgeon and nurses checking his peg site and other doctors who were going to put a cannula in so he can get IV antibiotics. He was fussing a lot, wanting to go to the toilet, we had put a nappy on him and told him to use that, he wanted to sit on the lounge with grandma, he was on my lap and the doctor said put him up on the pillow, he was talking a lot, telling the doctors he didn’t want the oxygen mask on, saying clearly “I DON”T WANT IT!” and telling us “ I have to huff and puff”. I put him up on the pillow, my husband had hold of his hand, he eyes rolled back, the doctor yelled THOMAS and he lifted his head and then passed away. They worked on him for 40 minutes, we were in the room whilst CPR was being done, then were taken to another room while two teams from ICU came down to work on him. At 10.49am he was pronounced dead. We went back into his room and spent some time with him. He passed away the day before his brothers 3rd birthday. 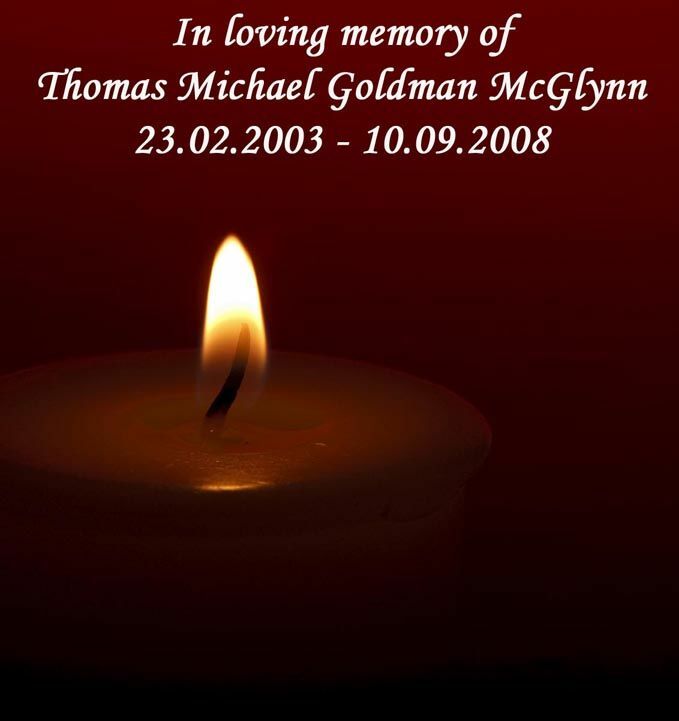 The Wednesday a week before he passed we were told by the social worker that the starlight foundation were looking for kids to grant wishes too and that Thomas was eligible, so she faxed off the application form. When the nurses came to get him from recovery to take him back to the ward, we were told that they had accepted his application for a wish to be granted and to start thinking of a wish. Thomas didn’t understand, as far as he knew he had every playstation game there was except for Madagascar 2, which wasn’t due to be released until the end of November, I had looked into it. When I saw the social worker on the Saturday I said he is going to get a wish granted and she said he had been accepted on the Thursday, and I took that as they didn’t think he was going to make it that Friday through surgery and since meeting up again with the staff I realize how very lucky we were to get back from such a simple procedure even if it was only for another 5 days. The staff at John Hunter Children’s Hospital Ward H1 and J1 (where he spent his second quick visit), Dr Garry Warner, Dr Richard Hawker, Dr Richard Chard, Dr Peter Ebeling and Dr Isobel Lang, we thank you immensely for looking after Thomas and giving him the best possible chance at life. There are so many staff at John Hunter Hospital that I would like to name but the fear of omitting someone, I have chosen not to personally name names, so all doctors, surgeons and surgical team, ICU, nurses, teachers .. everyone who seen and spoke to us, we thank you sincerely. Our stay at John Hunter will be forever a memorable one. Thank you. Search under our group PHAA to see if there are any current candles or feel free to light a candle and where it asks to associate with a group type in PHAA and we will all be grouped together.